There was a lot to cover in a small amount of time in the village. 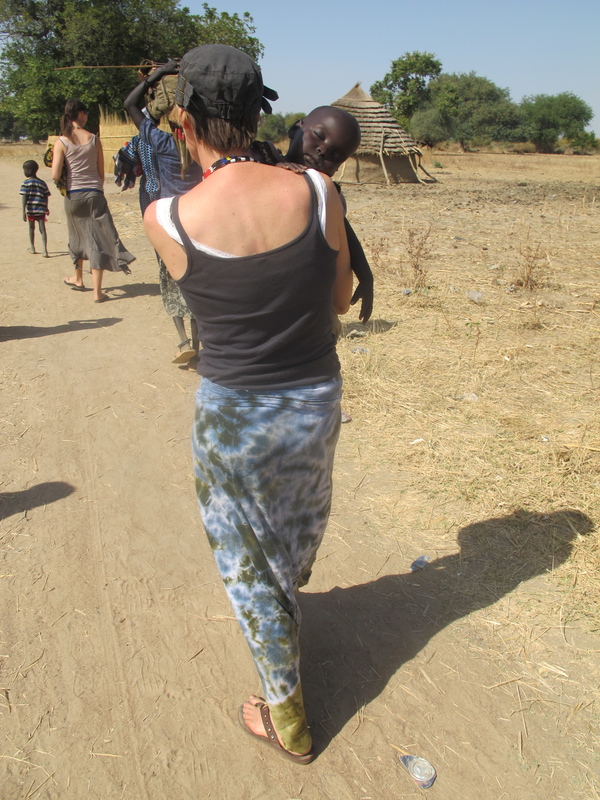 As our bodies started to acclimate to the heat and lack of food we began to get energized to interview and interact more directly with the residents in the village. You can fit alot into an “African” day. The roosters start to crow about 4 AM and the sun rises shortly after that and stays high in the sky for the nex 12 hours. I never wore a watch on the trip and it was amazing how quickly I was telling time by the location of the sun. We began the day meeting with the teachers and discussing educational needs. We found the most challenging aspect of sustaining the school is providing enough incentive for educated techers to teach. 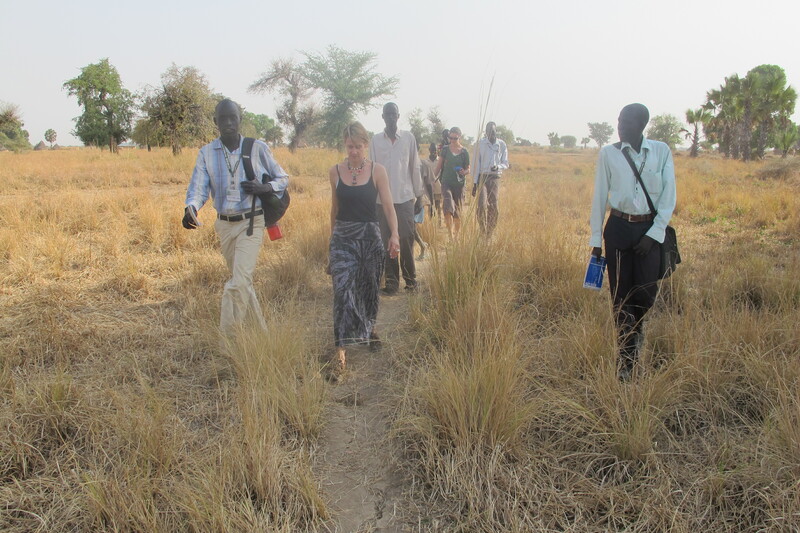 Education of any kind in South Sudan is a rare commodity. The few that have made it through secondary school have usually left the country through a sponsorship of someone in the family or a foreigner. When they return they are far more educated than anyone in the village and perhaps than many in the country. Their skills are so highly sought after that keeping them incentivized to stay is a great challenge especially when their is no support from the government. They stay though, because they cannot afford to continue on with university education. So each step of the way they are back in a stagnant place. It is our challenge to to try to get teachers on the Goverment pay list, but even that the pay is extremely minimal. Gabriel Bol continues to advocate to the Ministry of Education to pay teachers and put an emphasis on building schools and sustaining them. We ended the meeting by presenting the teachers with pencils and sharpeners for the students. The challenges are great in the new country and with so much emphasis on security and infrastructure, promises that are made to teachers are rarely kept. The other teachers we encountered have only a primary school education, still valuable in a place where so many are illiterate. Our challenge is to find way to continually train and reward teachers in the village. I cannot help but mention the incredible understanding I now have of the time, effort and emotion that Gabriel Bol Deng puts into this project. During our trip he worked tirelessly to meet with everyone he could, get opinions from top level officials to teachers and residents of the village, to holding and caring for babies, small children and pregnant women. He also had the added burden of making sure that Cory and I were doing ok and I know that I could not have done this trip without him and all his incredible connections. His life is split between work and family in the US and work and famly in the village. 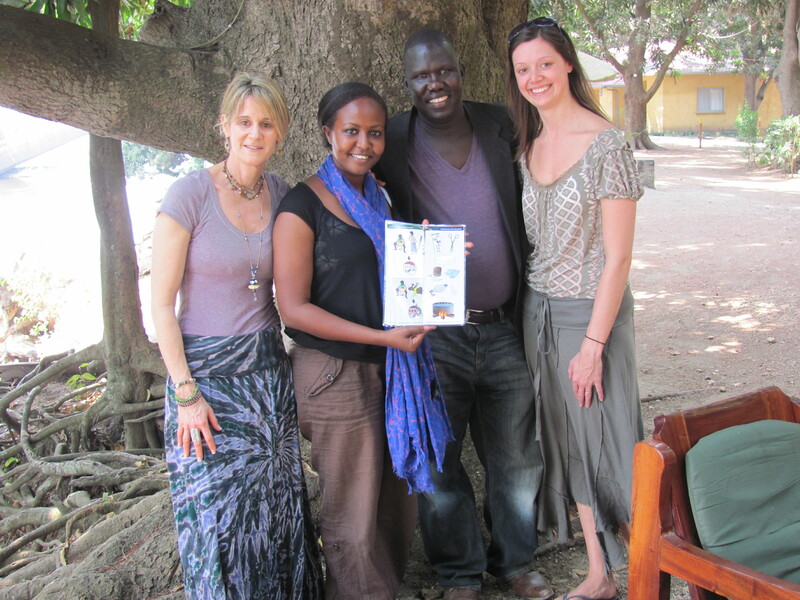 Wherever we went, from Juba to Ariang, people greeted us and appreciated us and knew that we were friends of “Bol’s”. Having a complete understanding of the difficulty of his task made the trip that much more meaningful to me. Next we conducted a meeting with Traditional Birth Attendants. These women have received this title from carrying the torch of generations past who have had the role. They have little to no training and care for women during birth using methods that were used centuries ago. Amazingly, many women fair well and the natural remedies and processes used work in many cases. The difficulty is when there is a complication. There are no clinics nearby and, although there are cars and roads now available, no one has the means to use them. Women are carried on stretchers for hours in the sweltering heat to a clinic where there may or may not receive the care that they need. 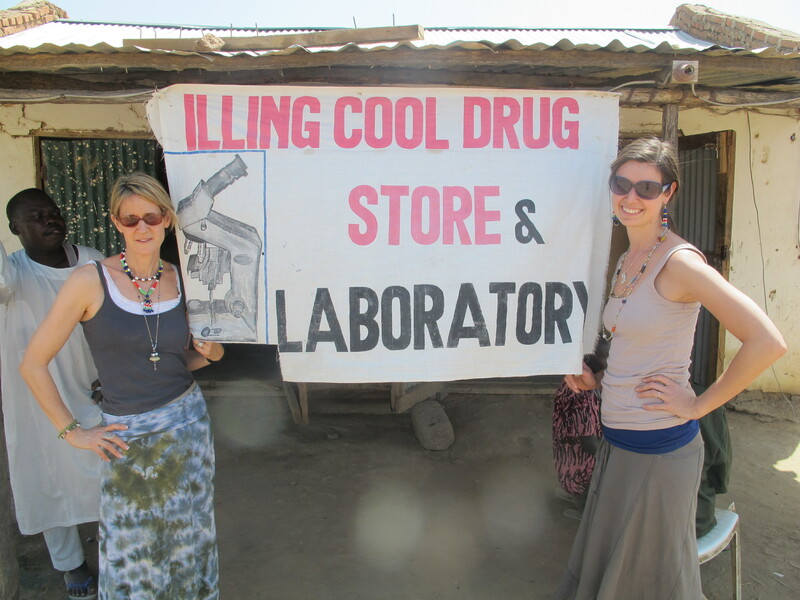 Clinics we visited in South Sudan store medications that were expired and not refrigerated when necessary. Cory spent a couple of hours reviewing some basic health care for emergency situations and best practices during child birth. Training and basic supplies such as latex gloves and suction tubes would make a huge difference in preventing infection and other complications but they are not available to these women. For two days I met with the group of women that run small business in the village. The businesses are extremely limited, most making tea or sell tobacco. Ariang and the surrounding villages have 10,000 residents and some of them do have small income that can filter back into the economy of the community if the goods are there. The first meeting had over 50 women and was a bit overwhelming but the next day we gathered a smaller respresentation who could discuss the economic needs and current situation of the market in the village. Hope for Ariang’s Education project provides income for many who work on brick building and other construction aspects of the project. 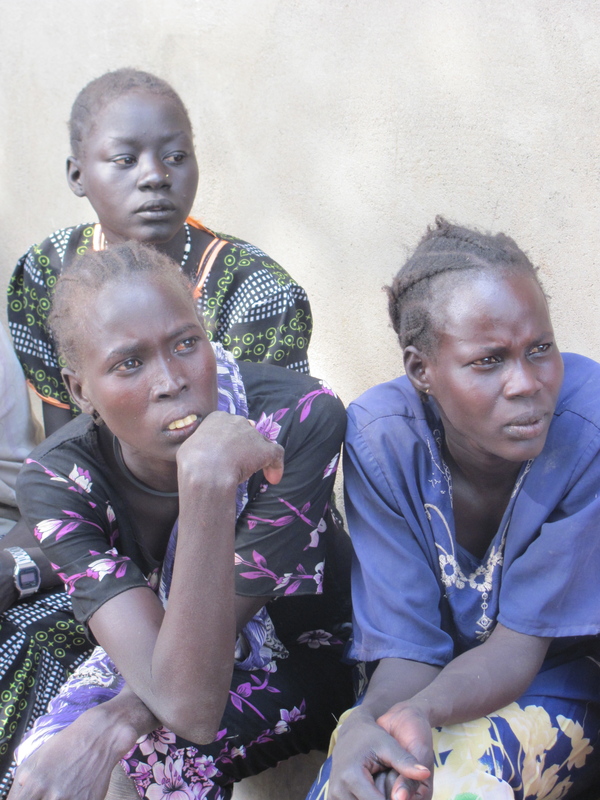 The women explained that people are going to the neighboring town of Akon to buy bread and Chipati and felt that if they had the access to an oven to make these items that the money would stay in the village and provide them with a small income to help feed their families. We discussed forming a coop wth all the small businesses to use an oven to make the new producst for the village. The ideas kept flowing and we left many options to evaluate. It was exciting to see the women hopeful and to know that the Sudan Canvas Project would be able to begin to provide for the fincancing of a project that the women would take owenership of. We explained that the purpose was to begin something sustainable by them, that they could grow and develop and that the project would be a partnership between the women of Ariang and the Sudan Canvas Painters and donors in the US. The feeling of hope became palpable. Gabriel and I left knowing that we would be propelled to move forward with the project so we could make a small difference in the lives of the women. Knowing that making a difference in their lives directly affects the lives and health of the children and ther ability to attend school. I have come to realize more than ever that the education project, health nutrition and sustainability of business are all interwoven to make the community develop. We cannot look at one alone. Cory and I ralized the importance of our advocacy work would not just revolved around discussing conflicts and the North but also putting pressure on the Southern Government to address these issues and invest in systems to move them forward. Our meeting ended with some ceremonious dancing. By participating we showed the women that we stand in solidarity with them, their hopes and their culture. …and I know Gabriel got a kick out of it too! Landing in Wau I can honestly say we had no idea what was in store for us. Our questions to Gabriel about life in the village were continuously answered with…”you will see”. Knowing that he wanted us to form our own impressions we began to just soak in the experience. The roads from Wau to the town of Kuajok are treacherous, but we have heard an enormous improvement from before the country gained independence. Wearing our nauseau bands and slipping homeopathic remedies in our water, we bumped our way through red earthed roads and woody shortcuts to enter Akon where we were greeted by the Paramount chief of the surrounding villages, Nyal Chan, (later to become known as “our favorite man”), and had a chance to talk about the conditions and politics of the country. Our first formidable moment was when we realized that our traveling campanion, Wol, was having an allergic reaction to the over the counter cold pill we have given him in the car. His eyes were almost swollen shut and he was short of breath. Frantically we insisted upon finding a clinic. Our first intro into healthcare facilites in South Sudan, expired and non refrigerated drugs run by a medical assistant with very little training was not comforting. South Sudan is curently prioritizing security, road infrastructure and training of civil servants. Health care has not quite made it to the top of the list and it might take years before it does. Clinics are run by untrained health workers or medical personnel with little education, mostly trained in other countries. Although not completely satisfied with the treatment, Cory’s nursing expertise was able to establish the best option, get Wol’s reaction under control and get us back on the road. 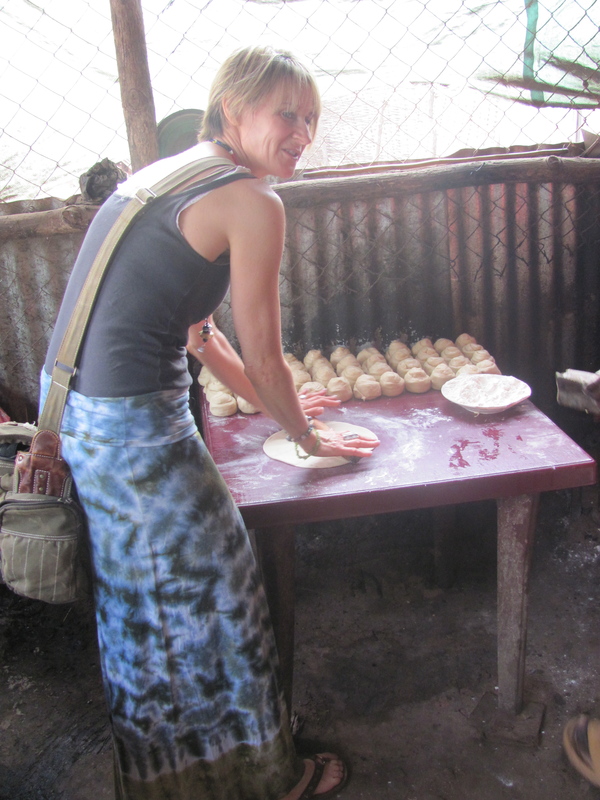 Once in Kuajok we made a stop to visit some of Gabriel’s family and learned about some local cooking traditions. as well as making another health care stop to visit Gabriel’s sister in law who is 8 months pregnant and suffering from various complications. Her daughter also needed medical attention as she was showing signs of malaria. Little did we know the seriousness of the health issues we would experience. As we worked our way closer to the village, the health condition of villagers grew more disconcerning. The lack of clinics, trained health care professionals, vehicles for transporting, and food for nutrition was alarming. We encountered a villager near death from starvation, children with distended stomaches and pregnant mothers barely eating. Effects of the the drought and crisis on the border of Sudan has reached far into the small villages. Humanitarian aid has turned to caring for incoming refugees from the North and those affected by tribal conflicts so many villages go without any assistance at all. But what was most amazing was that amongst what seemed to be such a despondent condition, we were greeted with fanfare, celebration, and traditional, dance and blessings by the most wonderful, joyous and happy villagers of Ariang. 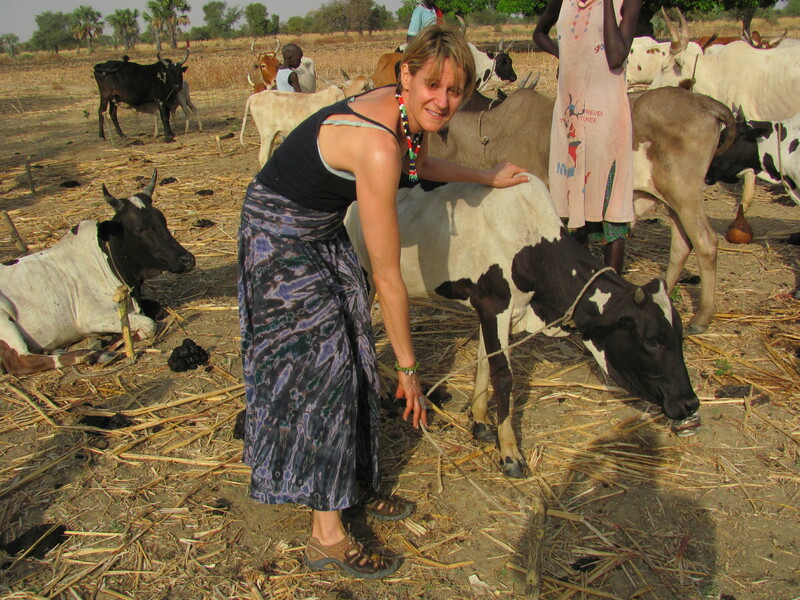 We ceremoniously stepped into the village over a sacred cow. Next we toured through Ariang school and inspected the classrooms and building and participated in a meeting where people from many surrounding villages came to welcome us and talk about the education project for the village. Life in the village took a while to adapt to. The scorching hot sun, red earth dust kicking up into our faces and lack of food made the thought of spending many days perilous, but each day we adapted a bit more, found small moments of comfort in a wet rag, cool breeze or walk by the Nile. Each day, as I became more comfortable, I grew to respect the resiliency of the people even more. I would watch them carry on all day without a sip of water or food not understanding how it was possible that they could carry bundles of necessities on their heads, cook in the heat and care for their families under these conditions. The villagers eat one meal a day made of the same wheat product called Sorghum that does not seem to have much nutritional value. (sort of like a flour/bisquick product to us). We were offered the traditional honor of a the elders’ blessing where we were doused with ritual water (which we were thankful for in the unbearable heat). Our first day was a wonderful entry into life at the village. Traditionally the first day is one of rest, sitting and talking and learning. We experienced sifting Sorghum and some traditional African drumming. The Dinka tribe make up a large percentage of the Southern Sudanese people. Cattle is the honored and respected commodity, each having its own name and place in the clan. Cory and I were blessed and given our own cows. It was a huge honor but also a bit daunting having to tie down our cattle in front of all the clan elders who have raised them as their daily occupation. After all the initiations, the sun began to set and the air began to finally cool as we took our walk back to the Tukul. After some game time with the children, the villagers helped us prepare our mosquito net outside where we would sleep under the African sky, full moon, and howling dogs. As Cory and I slept outside under our rig we could still hear celebratory drumming and singing through the night marking our arrival. We felt overwhelmed by all the fanfare but looked forward to beginning our work the next day learning about the lives of the women, health care and education. There’s Hot….And Then There’s Juba Hot! When we come out of our “container” sleeping quarters we are hit in the face with 110 degrees of humidity. We have respite when we are back at the camp along the Nile with a hot breeze but at least the air is moving, These residents along the river definitely have the right idea! People in Juba wear long sleeve fashionable shirts and sport coats all day. Dignity in dressing is very important to them. Cory and I scrambled to find the best of our limited wear to head out to our meetings. The more we had a chance to speak to both Sudanese residents and Sudenese foreigners the more educated we have become about the situation in Juba and the surrounding communitities and States. Sudenese who live in Sudan are extremely positive about the changes they have seen over the past few years. With paved roads they can now get from town to town when in the past a simple 1 hour ride might have taken a whole day of travel. I had expected the new growing city to be much further along in development but I have already learned that the tiny steps of growth like a tile ceiling or concrete wall in place of a restaurant under a tree is huge progress here. On the contrary, Sudanese foreigners seem a bit fed up with the lack of growth and development they see directly affecting the people outside of Juba. After breakfast we met with Alaa, Program Coodinator for a maternal and child health training program associated with Mass General Hospital in Boston, where Cory is a nurse. 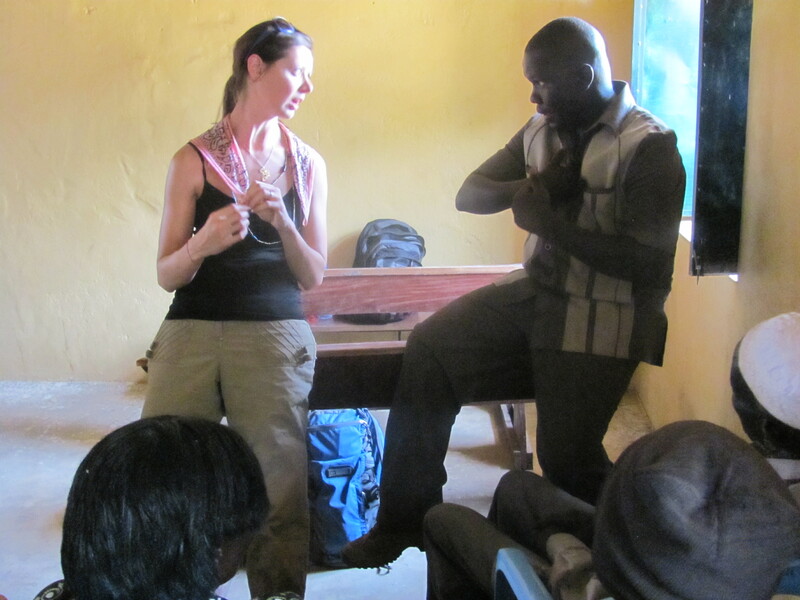 Alla discussed ways in which they train front line health care workers in rural villages to provide emergency care during child birth. 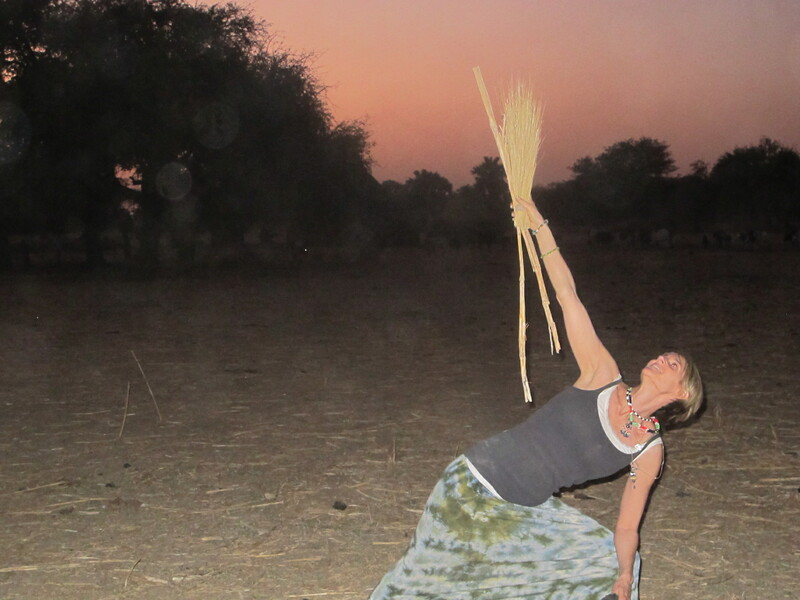 The program works by village elders selecting those in the village most capable of administering the program. 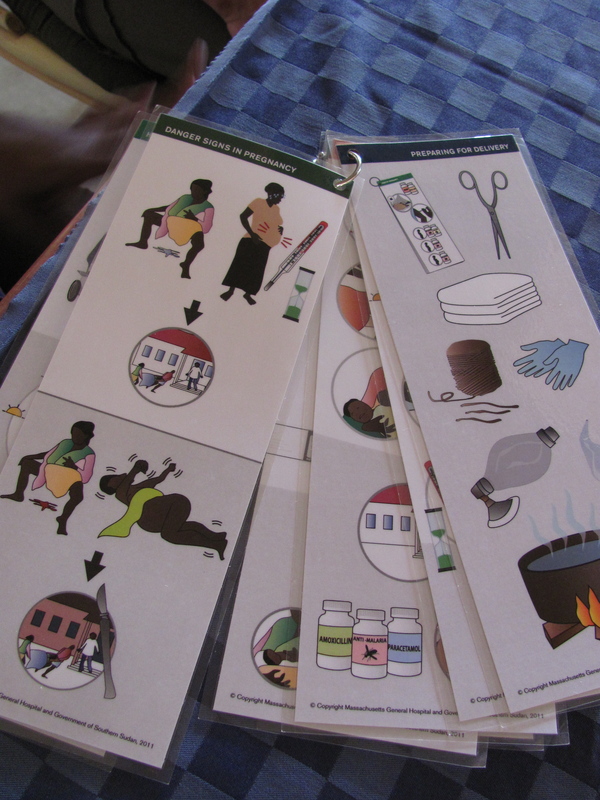 Due to the lack of literacy in most of Sudan they have put together a picture icon training booklet that will direct the provider in understanding emergency situations. The trainer is supplied with a package if basic medical equipment that can actually save a life during birth. 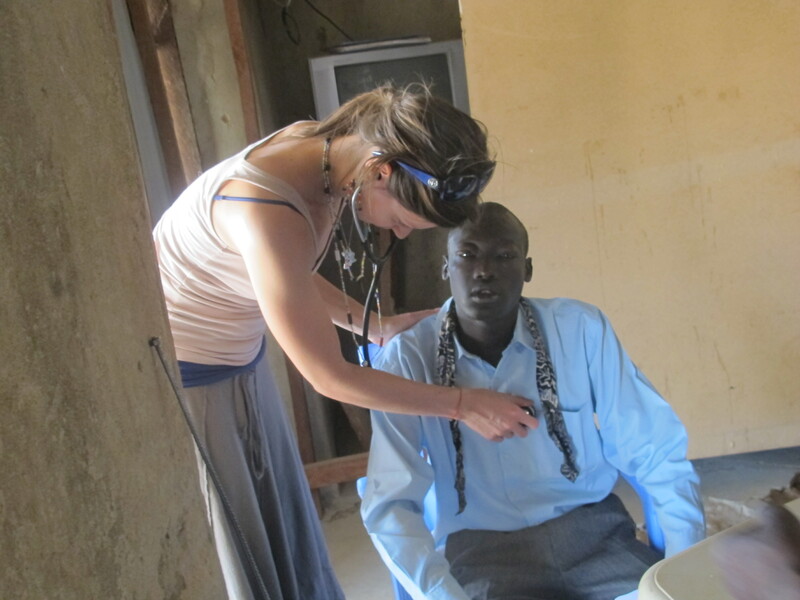 They have trained 72 master trainers in 10 States in South Sudan who have reached over 700 front line health care workers. Next we went to Roots center for Women’s Empowerment. Here we had the opporunity to discuss how a program training women to make jewlery has created economic growth within rural villages. 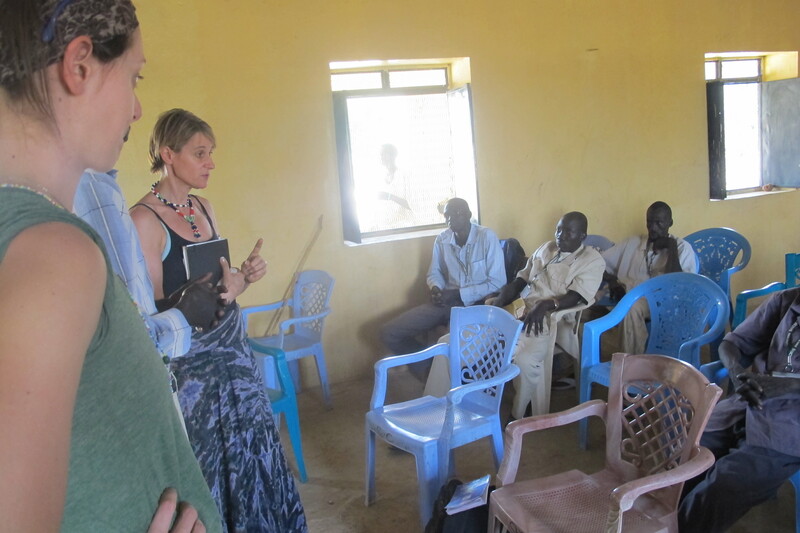 The program works mostly within communities close to Juba but hopes to expand to include other States of South Sudan. 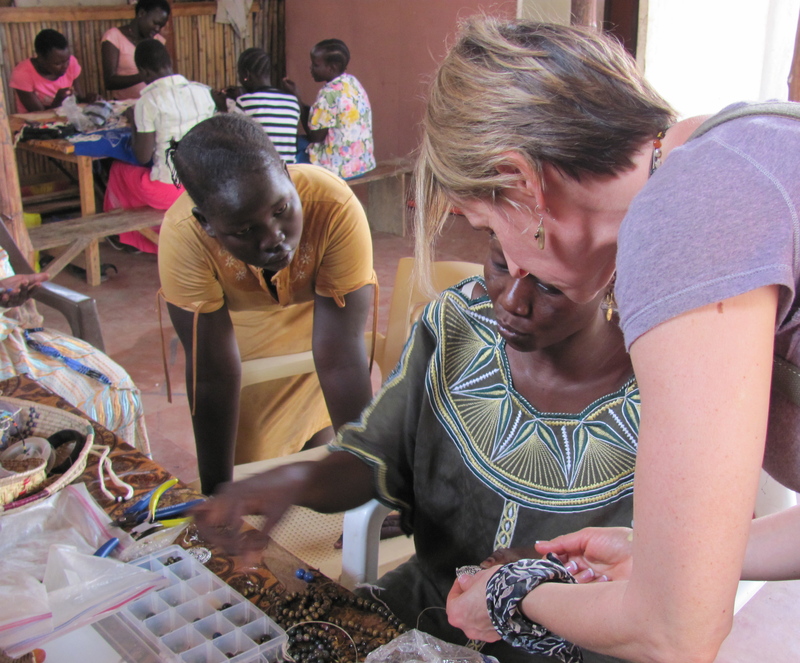 It was inspiring to see how the women were stringing beads using bamboo and other local resources. 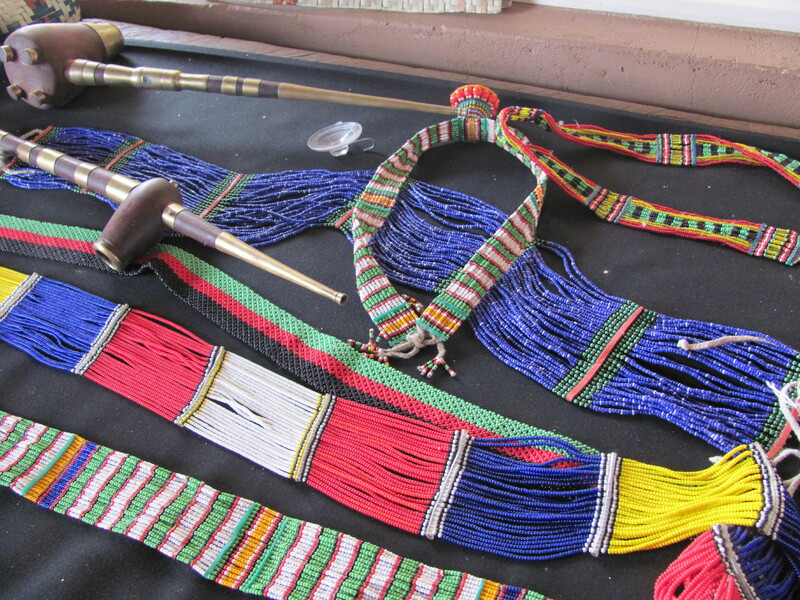 Women are brought to Juba in groups, trained in jewlery making in the workshop, and then sent back to villages with materials to work by themselves. We will keep this opportunity in mind as we evaluate the business possibilities for the women in Ariang. Cory and I were happy to support the women by purchasing a few gifts! In the evening we were treated to dinner on the Nile by Gabriel’s Cousin and Director General for the Ministry of Gender /Child Social Welfare, Santino Majok Deng. 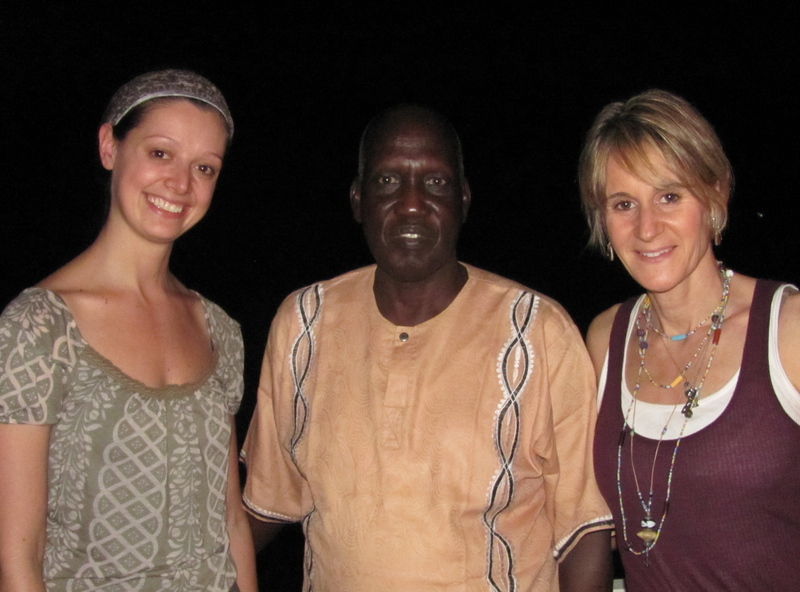 Mr. Deng has been overseeing a 4 million dollar womens’empowerment program funded by World Bank since 2009. The program grants $400,000 to each of the 10 states in South Sudan for financing entrepreneurship for women. Groups of women apply for the grants. The women’s businesses range from sewing for school uniforms to agriculture and cultivation. The advancement of women is a huge priority in the newly formed country. Although the funding for this project has ended, Mr. Deng was extremely interested in The Sudan Canvas Project and our business initiative with women in Ariang village. We also discussed the challenges facing the government, specifically the oil crisis, food shortage, border violence and tribal conflicts. I felt an incredible sense of committment to peace from Mr. Deng. Although these issues keep them from focusing on the development of important programs, they are committed to peaceful resolutions to these conflicts. We are so excited to now embark on the most important part of the trip, experiencing life in the village. We are leaving the compound in Juba to board our flight to WAU. Hope there’s a breeze there! Every trip starts with one adventure. 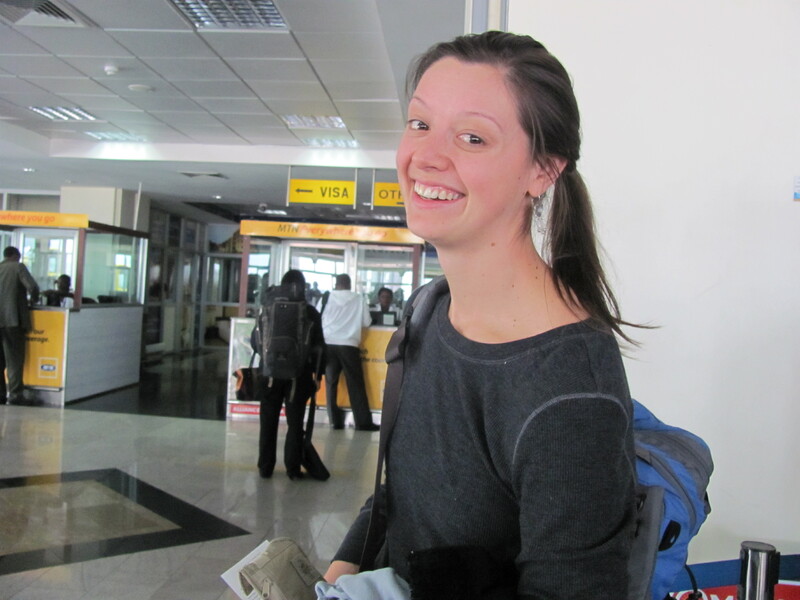 Ours was Cory almost missing the flight from DC to Addis Ababa, Ethiopia. I was prepared to go it alone and meet her there but she arrived last minute….exasperated…… and we boarded! The Streets of Kampala Uganda are hot and crowded. Add in the smell of the gasoline and the bumpy roads and you’d wonder why anyone would choose to come. 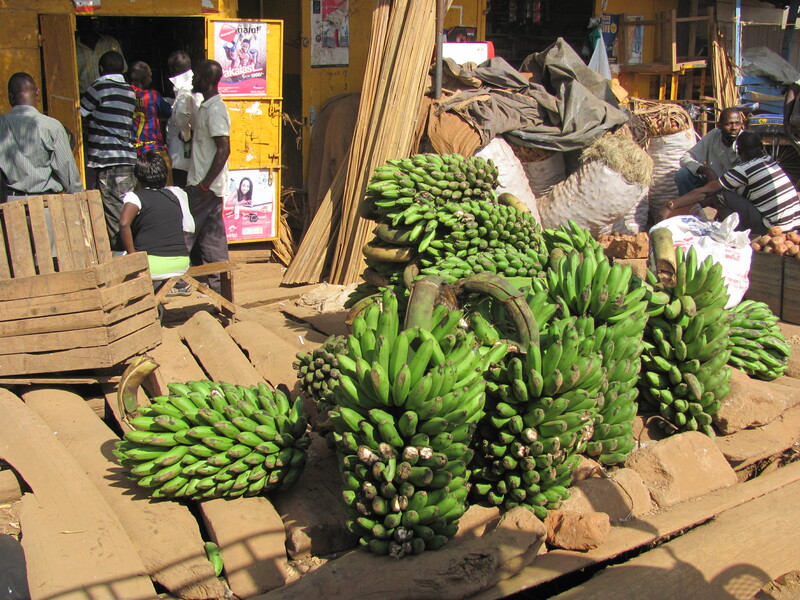 But watching the people lumbering by with incredible loads on their heads, whizzing past on either side with 4 to a motorcylce or seeing the piles of bananas, mangos and pineapples being wheeled down the streets makes the senses come alive. 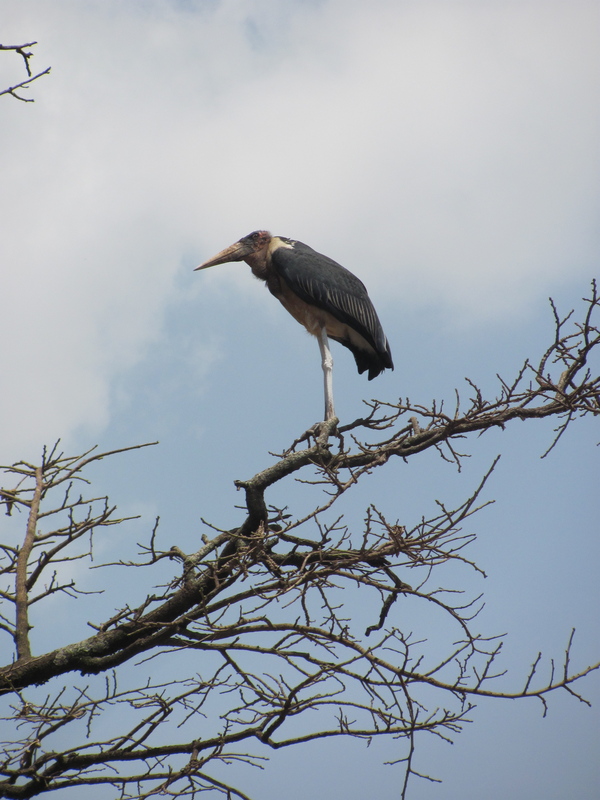 Look up into a tree on the highway and vulture sized birds sit in their nests above your head and you know you have entered an entirely different world. We came to Kampala for the purpose of bringing Aluel, Akook, Adual and Deng to boarding school. 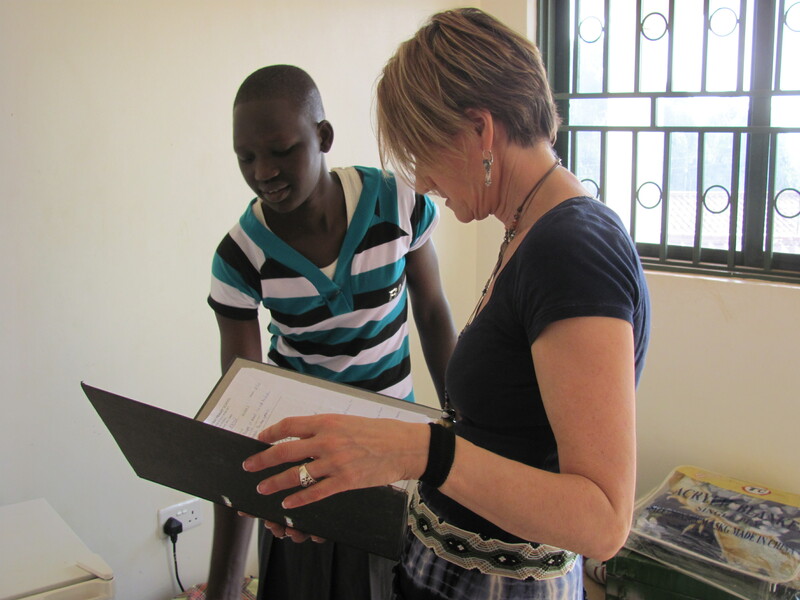 We spent the first day visiting, learning Dinka and of course, some art lessons. 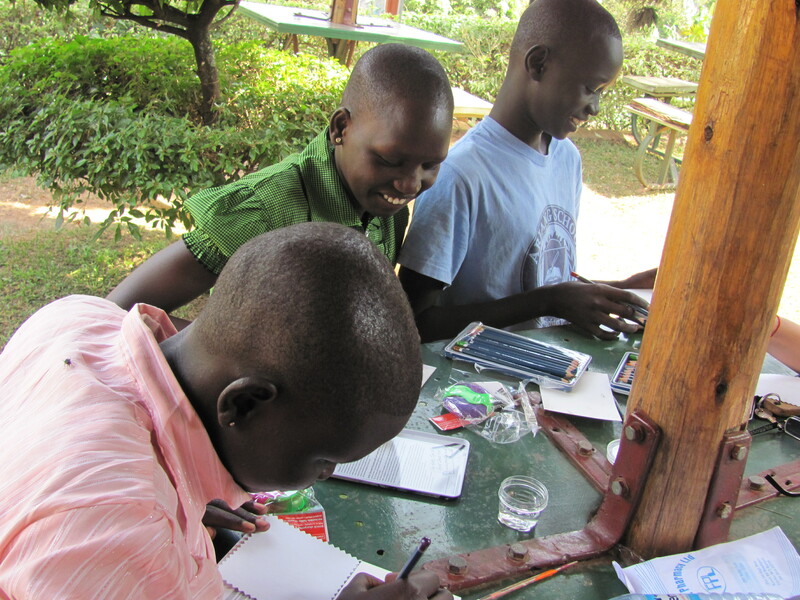 When we arrived to pick the kids up the next day they were excited to show us how they had filled their sketch pads. Each small painting was more colorful then the next with subjects from the New President of South Sudan to the US flag, fashion and flowers. They loved their watercolor gift! Next we were off to get them ready for school. Checking the packing list, shopping, and lugging… no different from taking my own kids to school. The only difference was they fit everything required, and I emphasize “REQUIRED”, in a small metal trunk and carried everything up three flights of stairs on their own. One trunk broke so we pulled over to a street vendor, bought a new one, threw it in the van and continued on. I might also add that these four Sudanese children, who were brought to Uganda for primary education in 2009, live alone in a small apartment to cook, clean and take care of themselves during their one month break. It was humbling to see how much they could do and how little they needed in their lives. Gabriel left me at the boarding school to “check them in” while he and Cory went to find a lost bag at the airport. I chose that assignment to be with the kids and also avoid smelling fuel for 2 more hours. It took hours to get their supplies checked in, uniforms ordered, bed selected, and money in the cantene. It was hard seeing their dorm room beds stacked 3 high with barely a mattress and side by side for rows; but observing their smiling faces and embraces with friends I new they were happy to be there and excited to be back at school. Unfortunately many friends from Sudan did not return from break probably due to inflation and the food crisis at home. Aluel, Adual, Deng and Akook know education will change their lives and they will do anything to stay in school. They also have to stay on top of the class to impress their Uncle Bol who they know is the reason they have this opportunity. It would make a huge difference in America if every child knew what it is like in a developing country with out opportunity for education. We are soon to get a real taste of it in the village. After a long, hot, day of errands we retired to the hotel where I crashed hard under the mosquito net and quite necessary breeze from the fan. Wake up call for 5AM, for our flight to Juba, South Sudan.